It'll be difficult not to dip into hyperbole, but that's what you get with something as ambitious as Cloud Atlas, a film that easily leads the year as most daring and bar none the most satisfying movie experience. The Wachowskis and Tom Tykwer have reached into a novel best described as inscrutable - Some would aptly call it cloudy - and pulled out a visual feast every bit as much for the brain as it is the eyes. 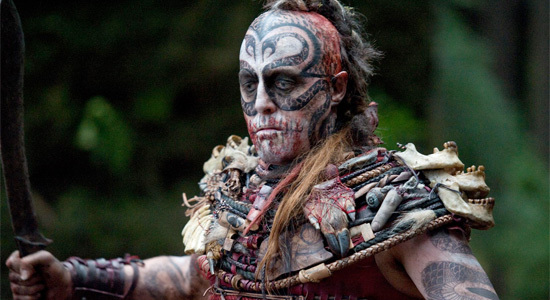 Cloud Atlas is the kind of film you need a break from, or its grand themes and colossal structure might overwhelm. But the rewards in experiencing and reflecting on it are precisely why we love films. Read on! Even the structuring is an ambitious undertaking, but we have David Mitchell to thank for that. Like his 2004 novel, Cloud Atlas takes us through different moments in time, six stories to be precise, each about a struggle to do what is right in the face of adversity, a common theme but never quite told like this. Mitchell's novel tells each complete story, but the filmmakers here choose to bounce between settings with little more than a quick cut, taking us from the Pacific Islands in 1850 to Belgium in the 1930s to San Francisco in 1973 to modern times in the United Kingdom then onto Korea in the distant future and a post-apocalyptic, distant future where tribes fight for survival. The characters we meet in these settings and their stories unfold quickly, Andy & Lana Wachowski and Tom Tykwer keeping the film's momentum always on the go. At first, Cloud Atlas feels like a deluge, your mind working overtime to keep up with who or where or what we're seeing. The uninitiated might throw their hands up in frustration when Doona Bae's Sonmi-451 appears, throwing what's previously been a period piece into the stylishly computerized world of tomorrow. But the Wachowskis and Tykwer understand their audience needs establishment, and their fast-paced introduction to these six stories right at the top of the film is a required foothold needed to let yourself sink into the overall story. From there, the writers/directors don't let the film's pace or structure get away from them, choosing to focus on two or three of the stories at a time and cutting between them for large sections of the film. As you experience each story, the underlying narrative and main theme - Really the reason why a collaboration of the makers behind The Matrix and Run Lola Run were perfect to bring this story to the screen - make themselves known. Each of the stories work on their own, but they also fit into the grand scope of what could only be referred to as the design of the world perfectly. Bits of information learned in one has a hand in the events shown in another, and every action by every character ends up having a purpose, almost a guide for Event A and how it leads to Event Z. Forget the Butterfly Effect. That's a ripple in a pond compared to the grand-scale ideas at work here. And if this description of the film is opaque thus far, it's because the themes Mitchell set down in his novel and the filmmakers have pulled out for this film are more easily explained through visual examples. Someone can tell you a letter written centuries ago can help spark a revolution centuries from now, but until you see those events play out in exceptionally detailed ways, the impact just isn't the same. Thankfully, the Wachowskis and Tykwer know precisely how to grasp the viewer's emotional chords as well as their mental ones, and the genuine power of Cloud Atlas rests in much deeper areas than even the Cloud Atlas Sextet, a beautiful piece of music that sits at the center of one story. Tykwer himself wrote the piece, and it's one of the most beautiful written for film in some time. The ambitious nature of the film married with the way they handle the depiction of their characters may be where Cloud Atlas loses some. Jumping between scenarios comes with its own share of tonal shifts scattered throughout, and you may be in a serious drama about slave traders one minute and a slapsticky comedy about a man trying to escape a nursing home the next. Nearly every actor in the film plays multiple roles, some switching up age, race, or even gender between parts. 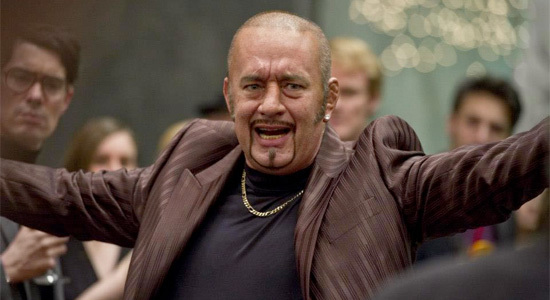 Seeing Tom Hanks as a Cockney gangster then watching him lead a post-apocalyptic tribe of survivors might keep the engrossment of much of Cloud Atlas at an arm's length. However, the intricate way in which every detail of this film is handled keeps the wheels on the track, and where most inexperienced or mediocre filmmakers might offer up an ugly wreck of a film, the three at work here have given us what could be viewed in years to come as a masterpiece. Hugo Weaving showing up in drag might bring up scattered unintentional laughter, but even that fits in with the story and tone at hand. Each actor takes absolute charge with each of their roles, as well, most of them quite literally disappearing in front of our eyes under heavy makeup and surely some CG facial enhancements. Nearly every actor has a part in each story, though many of them will be difficult to point out. Having said that, though, everyone in Cloud Atlas does a remarkable job, the chameleon aspect of much of their roles only a part of the praise. Whether it's Hanks as a quirky doctor with strange teeth, Halle Berry as a journalist trying to uncover a conspiracy, or Weaving as an enigmatic creature named Old Georgie who lives in the forests of the post-apocalyptic world, every actor gives every role their full attention. In doing so, the viewer does exactly the same thing. Some film makers are just working on a grander scale than others, and while Michael Bay and James Cameron are making mindless or semi-mindless adventures that look like a billion dollars, the Wachowskis and Tykwer are reaching for something with a deeper meaning. Cloud Atlas is another experience from them that brings an audacity and visual extravagance to a beautiful, moving, and audacious story about love and the effects such works of art have for future generations. It's a film about the enduring strength of our most powerful emotion and what one person's passion can lead to in the grand scale of the universe. Cloud Atlas is a film intended to endure, and bravo to the Wachowskis and Tom Tykwer for making it such an awesome experience. This got a score of only 59% on RT, but a 10/10 from Jeremy? Sounds suspicious. I wonder how well it will do with all the mixed reviews. This is one of the huge problems with critics. They want to prove how knowledgeable and sophisticated they are by trashing on original, daring projects like Cloud Atlas. I guess it makes them feel good about themselves. Whether or not they think this movie is great or not is irrelevant. Film criticism is so subjective, it is almost pointless. That's why critical opinion varies so wildly. Do yourself a favor and stop listening to critics. Cloud Atlas is a polarizing movie. It was always going to be. You don't even have to see it to know that. It will either speak to you and you'll love it, or it won't and you'll probably dislike it. This movie is worth taking a chance on. We need more daring projects like this to be developed. i thoght CA was very good - but not great....mostly due to some of the execution. i responded to you because you are SO RIGHT about needing more unique projects like this. i'd rather see a CA over 5 superhero rehashes.....sad to say - i don't think it'll happen - hollywood is always looking for the safe cash-cow. i would never cite RT for anything. Nobody, (not even film critics) walks into a movie wanting to hate it. Everyone loves a great movie. There are some movies that are universally praised like Argo, and I'm glad to have RT around so I can save my $10 for movies I'll actually enjoy. hey, if you and others want someone else to decide what you watch - that's fine. i don't. i watch everything that sounds good to me and do NOT rely on reviews. btw - i thought argo was "so-so" but i loved cloud atlas. rotten tomatoes loved argo and thought much less of CA. so, if i'd gone with RT, i'd had missed out on CA and only seen a argo....a movie i didn't hate - but didn't love either. well that's elitist of you. Gathering the opinions of scores of experienced movie-goers to help you pick between movies is not relying on reviews, its using a tool wisely in the decision making process. but hey, if you wanna spend a few hours watching a movie that got a 5% on RT without even taking that into consideration, I guess it's your time. But don't you see the hypocricy?! 'Word of mouth' is just a form of reviews! My issue isn't that you don't like RT, it's not my favorite either, my point was that there is some use to that average viewers opinion. We're almost agreeing really...you like to gather opinions by word of mouth, I like to gather opinions on internet forums and websites. The only place where we really disagree is that I'm more picky about what I watch. I'm more easily annoyed by watching a dud in the pursuit of good movies, while you seem to be more forgiving. To each his own, I just think a lot of people are like me where they'd rather let a few good movies slip through the cracks (and probably end up watching them a few years later if they are really that good) than watch tons of movies, many mediocre, to make sure we catch as many gems as possible. "word of mouth" is NOT a review. it's several friends simply saying they liked it.....THAT is what i meant by that phrase. as far as what/how/why you watch......that's your decision. I'm extremely excited, and this looks to be a divisive film. I loved The Fountain, and that was much of the same in terms of love/hate. Beyond that, acting like James Cameron and Michael Bay are making the same kinds of films is ridiculous. Avatar had more credibility than all 3 Transformers films combined. It had something to say about quite a few subjects, some felt like it was too much, some felt like it was barely there...but it's there. The movie DID have deeper meaning. Sure, it pales in comparison to films with the depth of 2001: A Space Odyssey or the aforementioned The Fountain. But Avatar operates on a level far above the works of Michael Bay. you bring up some all of the same problems i had with the film. it was very good - but i'd give it an 8.5 and no higher due to the issues you mentioned. i do wish more studios, directors, producers would try challenging stuff like CA. I kinda agree.. Especially about the cohesiveness. Or did I miss something? Can someone point me to a link that explains the connection between the stories? The one on imdb is from the book and the movie was slightly different. Was my most anticipated film of the year. I cried during the trailer, that's how much I connected with this film's premise. And I'm a huge fan of ambitious, thoughtful, out-of-the-box, epic filmmaking. Caught a screening last night. My thoughts (this might be spoiler-ish): - messy. editing is all over the place. - cockblocker. the moment I would get fully invested in a scene I'd be taken somewhere else. I never got to fully appreciate any one storyline. - makeup. lots and lots of makeup. some of it amazing, some of it so bad it's disturbing to look at. I can think of 4 makeup jobs in particular that I simply couldn't help but be distracted by. - music. at times distracting and really not that fantastic - i thought the stories would tie together more cohesively to express the idea of interconnectedness. I mean, isn't that the point of Cloud Atlas? I found that they tried to use dialogue to force this idea though. didn't flow as the trailers suggested A fantastic and thought-provoking idea that unfortunately missed the mark in a muddled way for me. Ambitious yet I felt that the first trailer communicates the grander ideas far better than the 3hrs I watched. Another overrated movie. Guess I didn't get my T-shirt in the mail. I've been reading this site for nearly a decade now and this is the first time I've ever completely agreed with you. The RT rating might lead you to think it's an average movie, but that simply isn't the case. This is a love-it or hate-it movie, much like 2001: A Space Odyssey which also deeply divided critics. If you don't get it, you won't like it. I'd also like to add that this wasn't a Hollywood film; all 100 million of those dollars were independently financed. 10/10 and the best movie experience I've had in 17 years. Gets better with repeated viewings, too. Bravo!